Do every thing you can to get ‘HB 4011’ passed and fix it so they don’t change it again!!! It’s a hard ship for young children and causes medical trauma for old folks having to tamper with the clock twice every year. LANSING, Mich. — House lawmakers want to make English the official language of Michigan. Republicans led the way in passing a bill Thursday that would require its use in public records. State departments and local governments still could publish documents in other languages. Rep. Vanessa Guerra voted no. The Saginaw Democrat says the bill could isolate people whose English skills are limited. Another critic, Rep. David LaGrand of Grand Rapids, says it’s a “dark moment” for the country if diversity is not embraced. LANSING, MICH. — Legislation introduced today in the Michigan House of Representatives enables law-abiding citizens to carry concealed pistols without obtaining a government-issued permit. The four-bill package is sponsored by Reps. Michele Hoitenga of Manton, Triston Cole of Mancelona, Sue Allor of Wolverine and Pamela Hornberger of Chesterfield Township. The legislation is a step toward reforming Michigan firearm law to stop law-abiding citizens from being punished for exercising their Second Amendment right to bear arms. 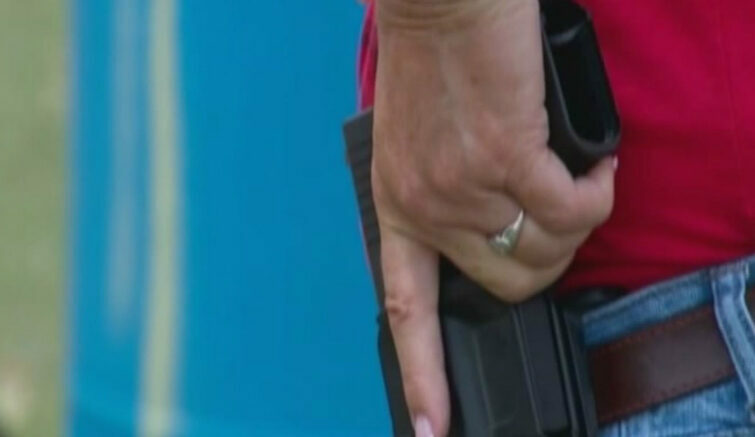 Under current law, Allor said a person without a concealed pistol license could be legally carrying a gun openly on his or her hip and merely putting on a coat makes them in violation of the law. Cole said people would still have to pass a background check when purchasing a handgun, and anyone currently prohibited from carrying a firearm will not legally be able to carry a concealed firearm if these bills are enacted. Hornberger said the state would continue issuing concealed carry permits; this legislation simply eliminates the requirement to obtain a license to carry in Michigan. The current permitting structure will remain in place to allow Michigan CPL holders to continue to carry in states that recognize Michigan’s permit. In addition, a CPL will continue to allow people to carry openly in certain restricted zones. The legislation was developed with input from the recently formed Second Amendment Caucus, co-chaired by Hoitenga, Rep. Jim Runestad of White Lake and Rep. Scott Dianda of Calumet. House Bills 4416-19 are expected to be referred to the House Judiciary Committee this afternoon. Now I have heard a federal judge has got involved. Why Michigan would let a federal judge get involved is nuts. The feds have no control over how Michigan pick its electors… a big waste of your money. Reported in the House on December 6, 2016 With the recommendation that the substitute (H-1) be adopted and that the bill then pass. Who knew about this? According to the summary it passed the House, Senate, and the President signed it into law and it is to be enacted two years from its date if I read it correctly. If this is true …it is huge…where was the media coverage? Repeals the United Nations Participation Act of 1945 and other specified related laws. Directs the President to terminate U.S. membership in the United Nations (U.N.), including any organ, specialized agency, commission, or other formally affiliated body. Requires closure of the U.S. Mission to the United Nations. Prohibits: (1) the authorization of funds for the U.S. assessed or voluntary contribution to the U.N., (2) the authorization of funds for any U.S. contribution to any U.N. military or peacekeeping operation, (3) the expenditure of funds to support the participation of U.S. Armed Forces as part of any U.N. military or peacekeeping operation, (4) U.S. Armed Forces from serving under U.N. command, and (5) diplomatic immunity for U.N. officers or employees. Folks this is our chance to get this right restored without having a court battle. Please make those calls. The purpose for this email is to bring to your attention House Bill 4847, which would restore Michigan citizens’ constitutionally-guaranteed right to a jury trial, including on lawsuits filed against the state. Specifically, HB 4847 would allow any citizen of Michigan to sue the state on any matter and demand a trial by jury in their district of residence. As provided by our state constitution, Michigan residents already have a right to have any lawsuit brought by them to be heard by a jury of their peers. However, that right has not been upheld by the current system in which lawsuits against the state are currently heard by the Court of Claims, which provides no trial by jury. HB 4847 would right this wrong and put in statute what is already in our state constitution. I hope you will contact these legislators today. If they hear from you, they will know that HB 4847 is a bill that they need to act on immediately. Thank you.